On a recent episode of The Early Show on CBS, guest and eco-interior designer Robin Wilson performed a green home makeover and recommended quality eco-friendly products that everyone can easily install in their homes to reap the benefits of green living. Among her list of suggested products was the Oxygenics Five Star Resort Spa showerhead. Water savings in the bathroom for the whole home can be quite dramatic. Sixty per cent of a family's water bill goes down the drain in the toilet. The first thing to do is install an Oxygenics low-flow showerhead said Wilson. with an Oxygenics IntelliShower Showerhead! The two-spray function showerhead takes the patented technology of Oxygenics to the next level of pressurized showering. The Oxygenics IntelliShower's dual sprays deliver invigorating full body coverage while saving 20-70% water compared to industry leading brands. The easy-twist spray selection lever makes enjoying each spray quick and easy. The first spray is the patented Oxygenics core which delivers an invigorating full-body spray and the Tri-Core spray incorporates three Oxygenics mini cores which create a wide, robust spray. Regardless of the inbound water flow, these sprays are sure to deliver a powerful punch of showering pleasure. Oxygenics technology saves thousands of gallons of water per fixture per year in demanding commercial and residential environments. Conserving water and natural resources is one way to move towards sustainability. Using a water-conserving showerhead not only saves water, but it also saves energy. The Oxygenics IntelliShower showerheads never clogs up or needs cleaning and is designed to work as well in 20 years as it does when new. IntelliShower Showerheads come in a Fixed or Hand-Held model. The Oxygenics IntelliShower fixed showerheads come in chrome finish. NOTE: We have one slightly used Chrome TriSpa Fixed Intellishower Showerhead in stock for $35.96 (20% savings). To order it, click here. The Oxygenics IntelliShower hand-held showerhead comes in brushed nickel. Self-Pressurizing Technology: Increased water velocity + air induction = MORE PRESSURE. The patented design ensures an invigorating pressurized shower spray regardless of water pressure. Saves Water and Money: Oxygenics uses 20-70% less water compared to industry leading brands. Each showerhead can save thousands of gallons of water per year which means significant energy and money savings. Wide Spray Coverage: Each spray setting is designed to maximize the water coverage area to make the most of each water drop. Both energizing sprays will envelop you in a drenching, powerful full-body spray. No Clogging Zero Maintenance: The internal components are made of Delrin - a material similar to Teflon which increase durability and eliminates clogging, mineral build-up and corrosion. No cleaning or maintenance required! Limited Lifetime Warranty: The Oxygenics IntelliShower comes with a lifetime performance warranty against clogging. Its guaranteed not to clog EVER. Flow restrictors have been placed in showerheads by manufacturers as a way to keep water usage at 2.5 GPM (gallons per minute) since it was mandated by the U.S. Government in 1992. This method of water restriction significantly decreases water pressure creating unsatisfactory shower performance. Oxygenics showerheads contain no removable restrictors and adapt to the incoming water pressure to use only what is necessary while still providing an extremely enjoyable and pressurized shower which saves a significant amount of water, energy and money. While other industry-standard showerheads flow at 2.5 GPM at 60 PSI (national water pressure average), the Oxygenics IntelliShower flows at 2.0 GPM at 60 PSI, offering 20% water savings. Not only is this savings significant in reducing water, but it also reduces energy costs as less hot water is used. Oxygenics showerheads adapt to the incoming water pressure, so as the pressure decreases, more water and energy savings can be expected compared to industry-standard showerheads that have a constant flow of 2.5 GPM. In some cases, as much as 70% water and energy can be saved by using Oxygenics showerheads. All Oxygenics IntelliShower Shower Heads include flow control, leak-free washers, teflon tape and installation instructions. The Oxygenics IntelliShower Series meets ANSI standard testing and materials specifications A112.18.1M-1996. Designed to function appropriately at pressures no less than 20 psi. Constructed to withstand pressures of 150 psi and temperatures up to 160 F.
The internal components are constructed of injection molded Delrin acetal. The pieces are machine pressed into the base and cannot be removed with a straight pushing or pulling force of less than 100 lbs. The cores are constructed of Delrin acetal resin. 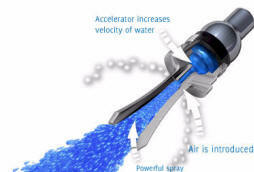 Each core spray uses a venturi system consisting of 16 air entrance ports, which allow air to increase the spray velocity. Oxygen levels in the water are increased as well. The showerhead face and outer shell is made of plated ABS plastic enhancing the showerheads appearance and muffling the spray functions. The wand holder and fixed base utilizes a ball and socket allowing for adjustment. Ball is constructed with Delrin acetal. The seating washer is designed to seal around the ball swivel when compressed by assembly. On fixed models the base connector is made from free machining aluminum and CBA alloy. Bases fit any standard 1/2 male threaded shower arm. The 60 hose and holder are constructed of ABS plastic, aluminum, and zinc. Both are designed to withstand pressures of up to 100 psi. Lifetime warranted against clogging and defective material and workmanship. Add a Sprite Shower Filter with patented Chlorgon filtration media to your Oxygenics Shower Head for the ultimate shower experience. Oxygenics Fixed showerheads work with Sprite High Output (1 year filter) or Slim-Line (6 month filter) Shower Filters, while Oxygenics Hand-Held showerheads work with the Sprite Universal In-Line (3 months) Shower Filter.